So you want to share your faith because you realize that when it comes to things like...oh, say...eternity, there is just too much at stake to keep the Good News to yourself rather than share it with others who might receive the grace God freely offers them in Jesus Christ. Great! But now what do you do? In spite of knowing what you should do, you find yourself making excuses like the following. I don't know much about the Bible. I don't want to offend anyone or make them uncomfortable. I'm not that great at following Jesus, myself. I grew up being taught you don't talk religion or politics (unless you are online, of course). Let me offer some pastoral counsel on this kind of thing. Get over it!! One of the things Paul says to Timothy is, "...do the work of an evangelist, carry out your ministry fully." It is interesting that Paul says "OF an evangelist." The implication is that Timothy was not one. Even so, Paul seems to think that Timothy's ministry is not complete unless he is evangelistic in his work. I think there is a strong message in that for us as well. So how does a non-evangelist do the work of one? 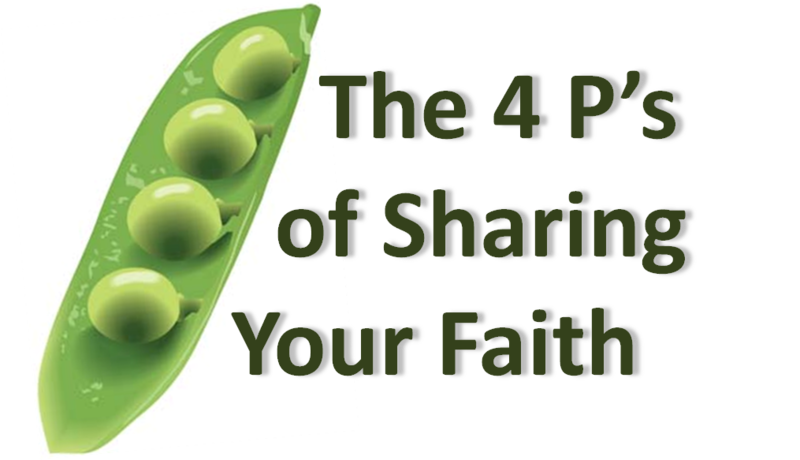 I think there are 4 keys to sharing our faith, even if it feels like it's not in the wheelhouse of our personality type. 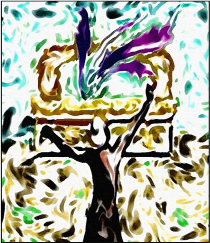 And because I was bored, I'm so fancy, I am creative, each one starts with P.
While I am not the first to say it, all of our faith-sharing begins with the immeasurable value of people created in the image of the living God. There is no such thing as an evangelistic project. People are not projects! God holds each one of us as dear, and if are to go about this with the heart of God, we need to see the people we are trying to reach as cherished children loved by a father that is infinitely holy and good. And remember, if you are not willing to be their friend whether they ever come to faith or not, then do everyone a favor and just forget about sharing your faith altogether. As you consider the person or persons with which you might share your faith, consider those in closest proximity to you. Think of your spheres of influence - friends, neighbors, co-workers, classmates, those in your social circles, family, etc. These are the people God has placed in your life, and you in theirs. So consider making some of these the subject of your prayers. Your purpose is not to judge them. But if any of them indicate that spirituality or God is not really part of who they are, you may begin to pray for those persons. Those with whom you already have some kind of relationship are those most likely to respond. Unless you have been a total jerk, there is likely some level of trust and familiarity upon which you can build. Praying for those in proximity to you, with whom you might share your faith will do three things for you. First, it will help identify those within your spheres of influence you might share your faith. Second, as you ask God to help you be aware of who might be living without God on their radar, you will suddenly become far more aware and in tune with the needs and struggles of the people around you. And as you begin to pray for God to open a window of opportunity for you to start a spiritual conversation with them, you will begin to genuinely care for and develop a compassion for those you want to reach. It is hard to put yourself in judgment over people you are holding up in prayer. Finally, all of these things working together will create within you a sense of urgency to reach those people you find yourself thinking about and praying for. You may even find a greater motivation to live more faithfully in the way of Jesus, yourself because you will want the witness of your life to match the witness of your words. This may be the hardest thing. Just remember that this is not a race. If the person you are trying to reach pushes back, then back away. Just be their friend. The truth is, the only way you will have any credibility at all is to show them that you are their friend whether they ever come to trust in Christ or not. Pray. Speak up when appropriate. Invite them to church when appropriate. Leverage your proximity and invite them to go to lunch with you, or to play golf, go to a movie, hang out at the pool, go shopping, hit the gym, go cow tipping or whatever else you might be doing anyway. This costs you no extra time or money. You are just taking someone with you. And let your life be a witness to God's goodness and faithfulness. Don't put on a show or be fake in any way. Let them see you - struggles and all. But let them see how a real person of faith responds to and navigates through a real life while trusting in Jesus. And then give God time. You do not have to be a Bible scholar. And you don't have to be a pushy, obnoxious jerk. You just have to be you - the person God created you to be. And you have to be a friend. May God give you eyes to see who it is in your life that just may be waiting for someone to help them connect to a life-transforming faith in Christ. May you begin to pray regularly and consistently for this person, and for a window of opportunity to share your faith. And may God give you the heart for others and the sense of urgency that matches the stakes that compelled Jesus to give everything he had for those who were far from God. Great post - thank you. Four very practical and common-sense points.